The high biodiversity in tropical forests has both fascinated and puzzled ecologists for more than half a century. In the hopes of finding an answer to this puzzle, ecologists have turned their attention to the spatial patterns of such communities and mapped the location of each tree with a stem larger than a pencil in plots covering 25 to 52ha of tropical forest around the world. 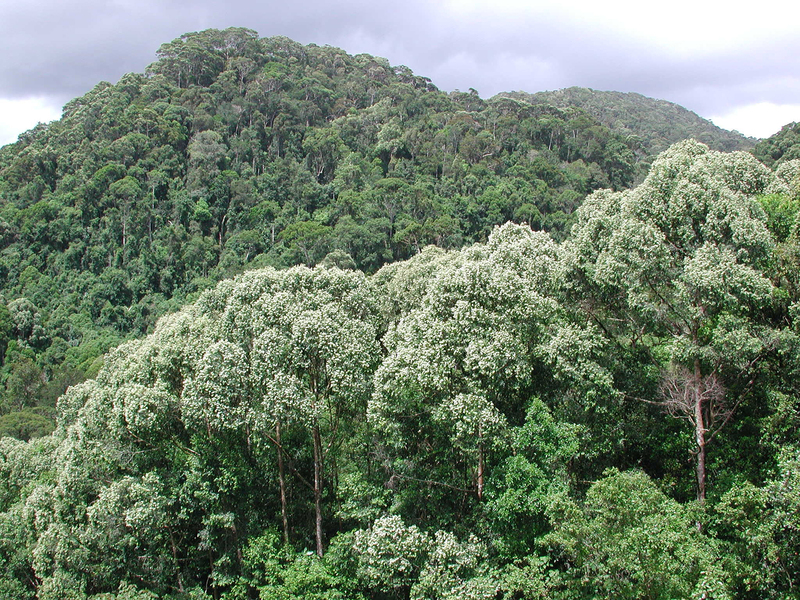 In a study published in The American Naturalist a German - Sri Lankan research team has now undertaken thousands of spatial pattern analyses to paint an overall picture of the association between tree species in one of these plots in Sri Lanka. Shorea trapezifolia in bloom. S. trapezifolia is one of the most dominant canopy species preferring well drained middle and lower hill -slope habitats. It is one of the annually flowering Shorea species which co-occurs with mast-flowering Shoreas. S. congestiflora, an annually flowering species is more dominant at lower altitudes than at Sinharaja - a vicariant of S. trapezifolia. 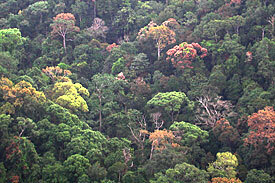 Canopy of lowland hill dipterocarp forest in Sinharaja taken from the top of a lowland hill - Sinhagala (about 800m asl). It shows different species in different stages of leaf flushing (light green) and early fruiting (pinkish - red) stages but none in the picture in bloom. "The problem of studying spatial association between species is that habitat association confounds the effect of plant-plant interactions" says Dr Wiegand, senior scientist at the Helmholtz Centre for Environmental Research in Leipzig, Germany. The breakthrough in their analysis is that it allowed them to disentangle these two effects and to look in a new way at their data. "From previous studies we knew that growth and survival of trees depends quite strongly on their neighbors" say Savitri Gunatilleke and her husband Nimal, both professors at the University of Peradeniya, "we had therefore expected to find strong signatures of positive or negative interactions between species in our data". "However, the fact that not more than 5% of the 2070 species pairs we have analyzed showed significant associations is quite remarkable." A conclusion of their study is that neighborhood-dependent processes may equilibrate, thereby producing neutral association patterns in the spatial distribution of trees. "This is certainly not the last word in this debate," says Wiegand" but it is a step towards an understanding of the complexities of the origin and maintenance of species richness in tropical forests." The Helmholtz Centre for Environmental Research - UFZ was established in 1991 and has about 830 employees in Leipzig, Halle/S. and Magdeburg. They study the complex interactions between humans and the environment in cultivated and damaged landscapes. The scientists develop concepts and processes to help secure the natural foundations of human life for future generations.